It’s that time of year again, where heart-shaped food is everywhere, and this dessert suggestion is no different. Valentines Day falls on a Saturday this year, so I’ve gone for simplicity in that there’s no actual baking involved, thereby freeing up the rest of the day for a constant stream of romantic gestures. It’s also not the original recipe I had planned for you, but that other one, although unusual, simple and delicious, delicately plucked from the fading pages of a centuries old manuscript…. involved peeling 20 grapes and who needs that kind of stress on the weekend??? This is basically a refrigerator cake with a posh frock on, where frock = booze, although you can use orange juice/zest if you prefer. A quick dip in some melted chocolate, a sprinkling of freeze-dried strawberry powder and it looks quite the picture of elegance. This quantity makes two, admittedly quite thick, hearts. I initially made them thinner, but promptly got into all sorts of bother/mess trying to dip the tops and bottoms in the chocolate and still keeping them looking neat and well finished. So for ease of dipping, I’d recommend making just two – after all, you don’t have to eat ALL of it in one go and a Valentine token for your beloved isn’t supposed to require a batch bake! You won’t need all of the chocolate, but using this amount makes dipping easier. You can keep any excess for use in other recipes. 60g dark fruit conserve or jam – cherry, raspberry, damson, etc. Break the biscuits into the bowl of a food processor and blitz until the mixture resembles crumbs. Because that’s exactly what it will be. Tip into a bowl. Add the rest of the ingredients and either mix by hand, with a spoon, or with a stand mixer fitted with the standard paddle. It should come together quite easily, and hold together when pressed. Tip out onto a silicone mat (it will be rather sticky). 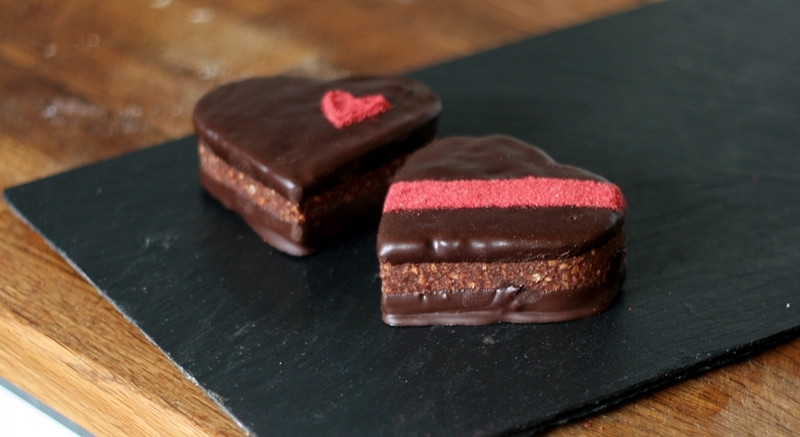 The easiest way to form the hearts is to divide the mixture into two and press it into a heart-shaped biscuit cutter. Once the mixture is packed tightly, a gentle press will ease it out of the mould. Carefully wrap the two hearts in cling film and place in the freezer for at least an hour, or overnight, whichever is most convenient. Break the chocolate into a bowl and melt, either over hot water or in the microwave in 1 minute bursts, stirring after each minute. Add the oil and stir thoroughly. Remove the frozen hearts from the freezer and unwrap. Lay a sheet of baking parchment or silicone baking sheet next to the bowl of chocolate for putting the hearts on, to set. Dip the top of each heart into the melted chocolate about 1cm. Lift it out and turn it on its side, letting the excess chocolate run off the side, leaving the surface smooth and even. When it has stopped dripping, turn the heart upright and set onto the baking parchment. The coldness of the biscuits will cause the chocolate to set within a minute. When firm, carefully lift the hearts, keeping your fingers away from the chocolate top, to avoid smudging. Dip the bases. Set aside to cool completely. Decorate with freeze-dried powder sprinkled inside a mini heart-shaped cutter, or make a ribbon by laying two sheets of paper across the chocolate heart and sprinkle the fruit powder between. Carefully remove the sheets and shake the excess powder back into the sachet. They look so beautiful and I bet they taste heavenly! Well done! Only just found this website so can I just get gushing fan bit out of the way and say I loved it when you wrote “Sasha” on your sacher torte! So my question is, why do you put vegetable oil in with your chocolate? Apologies if you’ve explained this elsewhere. The oil is to prevent the chocolate setting slab-like and thus requiring chisels to crack into the dessert. You can use clarified butter instead if you prefer.